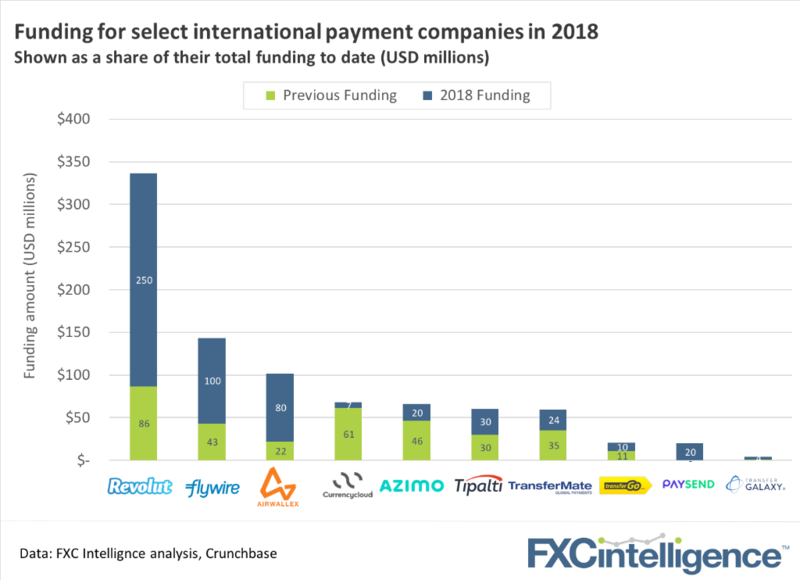 July saw three significant B2B investments in the international payments space: Airwallex (liquidity & rails), Flywire (processing international payments for healthcare, education and business), and Transfermate (business payments and ERP integrations). These companies join a broad range of other B2B players that have received funding to tackle a wide range of business payment problems. This stands in contrast to the consumer side, where only four transfer groups have raised nine figures of equity – Revolut (this year) and previously TransferWise, Remitly, and WorldRemit. Coupled with the lack of significant funding rounds for B2C groups this year (outside of Revolut), this may suggest cooling investor appetite for solely consumer focused brands. 2018 was a big year for many of the companies above with most raising many times what they had previously as scale was sought and investors bought into growth stories. What’s driving this latest funding push and what can we learn from the mix of investors? We spoke this week to some of the key players involved. Does Asia hold the key? I asked Mike Massaro, CEO of Flywire, about the shift to an Asian-based lead investor. Temasek is giant Singapore investment fund, with a portfolio of c. $238bn as of March this year and around a quarter of it in FinTech. “They [Temasek] have a world view that few other venture firms can offer and as a global company ourselves, that is invaluable. Asia-Pacific is responsible for about 60% of our revenue today and we see even greater opportunity to expand there. Temasek’s knowledge and influence in the region can open a lot of doors and provide us with market insights we can’t get elsewhere.” Mike Massaro, CEO, Flywire Airwallex, based out of Melbourne, raised $80m in July to strengthen their position in China and expand into additional markets. The investment was led by Tencent, the $500 billion Chinese internet giant, and VC firm Sequoia China. Airwallex is in the process of applying for a third-party payment license in mainland China and also a cross-border Chinese yuan license to further strengthen its value proposition. At the other of the spectrum is Transfermate, which has just completed a large push into the West, overcoming the burden of state-by-state US regulation. Whereas virtually all the companies in the chart above raised funds from VCs and investment houses, Transfermate bootstrapped their business from the beginning. They have taken only two investments, one from Allied Irish Bank and an additional round this past week from ING Bank. I asked Sinead Fitzmaurice, Co-Founder of Transfermate about this. “Whilst many in the industry take on venture/PE funding to focus on customer acquisition as a core strategy, our strategy to date has been very specific on executing our regulatory footprint and technology build first. Hence raising capital now together with strategically partnering with banks is a perfect alignment of our regulatory footprint and technology.” Sinead Fitzmaurice, Co-Founder, Transfermate Some companies prioritise growth first and infrastructure second, others do the opposite. Different paths. The shear range of investors – from banks to giant investments houses – and the global reach of the payments industry suggests there is a long way to go and many opportunities for new business models. Research published this week showed the payments industry has become a more attractive investment than pure technology, as shown by the returns over the last year in the public markets where payment companies have outperformed tech. With numbers like this, expect to see more investors lining up.